This install log is for an Ubuntu server. For a Xen/Fedora server, see EMFT Build Server Setup. Annoyed by beeps when you backspace or tab in a console? Disable the system bell by removing the pcspkr module. If upgrading from an existing server, you can copy the old server's ssh keys so that the server will "look" the same to users connecting via ssh. Copy contents of ~/.ssh/id_rsa.pub into ~/.ssh/authorized_keys file for user on dev.eclipse.org who will be running builds. This is so that the web user can commit changes to cvs (tagging, updating map files) for I, M, S & R builds. This is only required for EMF builds. Copy both .bashrc and .bash_profile into /etc/skel, so that new users will get these files in their home dirs. For consistency w/ other servers, edit /etc/apache2/sites-enabled/000-default and set Apache's default DocumentRoot to /var/www/html instead of /var/www. Not required on Fedora (config file found in /var/httpd/conf/httpd.conf). This is particularly important if you plan to run more than one http server on your build box. See EMF Build Server Setup/Lighttpd. "Mapfile_Rule_Default" => 0, // 0: "Use Map, No Tagging=use-false" or 1:"Generate Map, No Tagging=gen-false"
AuthName "Build Server Password Required"
Then create a password file in /path/to/password/file. You can use htpasswd to generate the password. Check the website, http://servername/modeling/emft/newComponent/build/ -- this time, you should be prompted for a password. Depending on your browser, you may have to close & reopen it. From the build page, http://servername/modeling/emft/newComponent/build/, fire a build. Directories, eg. /home/www-data/build/emft/jet/downloads/drops/1.0.0 must be writable by the web user (or group www). See #Fix permissions & ownership. could be a problem with ssh keys (see above - #Fix web user (www-data)) or the method CVS uses to connect (rsh instead of ssh - see #/etc/bashrc). Builds - including unpublished Nightly builds - are listed on the downloads page here: http://emf.torolab.ibm.com/modeling/emf/downloads/. Published builds are located here: http://downloads.eclipse.org/modeling/emf/downloads/. Then copy .bashrc, .bash_profile, and .alias from an existing user to the new user's home dir (if /etc/skel is not used). Run it. On next boot it should run by itself. Note: this may not be required. If that worked, you can now enable UI testing in your builds! To connect to the build server via a remote X connection (with ssh-tunnelling for security), you need to install a VNC viewer client on your local machine, and a VNC server on the remote machine. If you use linux, you can also use krdc + rdesktop on the client side and krfb on the remote side, or a combination thereof. Remote desktop connection to buildbox server. 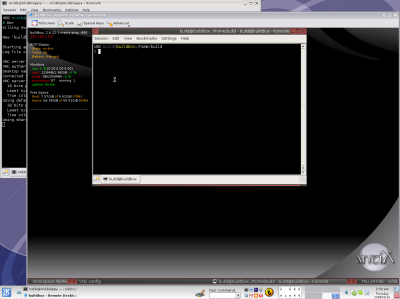 In this example, the local server is running the K desktop manager; the remote server is running the fluxbox window manager. To connect to the remote desktop, simply type 'bbr'. Once it loads, you can start up Eclipse, browse build server files, etc. Note that if your local machine is running Windows or Mac OS, the process above is more or less the same, but you'll need install the correct VNC viewer for your OS. See RealVNC or TightVNC, for example. Additional info and configuration steps are listed in EMFT Build Server Setup. This page was last modified 19:13, 12 December 2008 by Nick Boldt. Based on work by Nick Boldt and Martin Oberhuber.